She’s finally here! This pattern has been a long time in the making, and I couldn’t be more excited to share her with you! Have you ever worked on a project that you were super fired up about, only to have to let it sit there patiently waiting for you to address other priorities before giving it your full attention? That’s exactly what happened with the Modern Aztec quilt pattern. I designed her all the way back in the summer of 2017, but other quilting commitments kept me from being able to make her. When I finally did, I unexpectedly changed the original design from 5-colours to 10-colours (more on that in a minute) and you loved it so much, I felt the pattern needed both options. You also showed lots of interest in the table runners, so I just kept adding to the pattern! 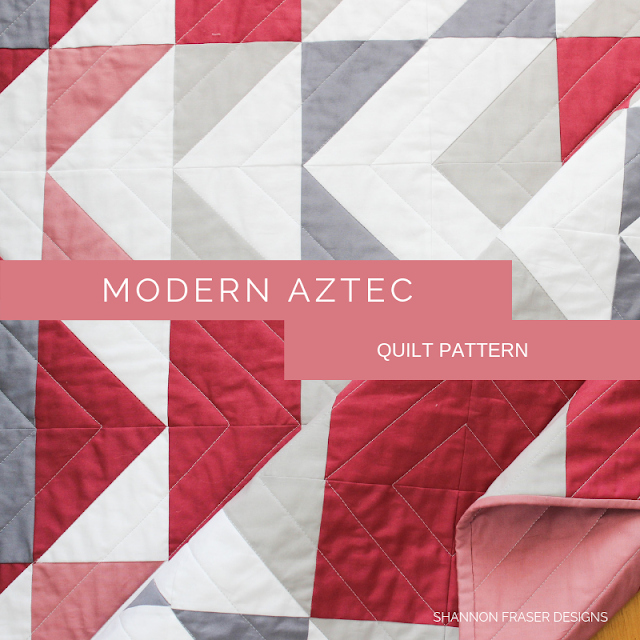 Get the Modern Aztec Quilt Pattern here. Which brings me to the fun of sharing all the features and options available in the Modern Aztec pattern. The pattern is structured in a way where there’s essentially 5 different patterns packaged in 1! That’s a lot of details and quilty math to get through! But my rock star pattern testers have done an amazing job helping me ensure the pattern is as clear and easy for you to navigate without losing all that information. Then there’s the 10-colour quilt option with the fabric and cutting requirements for all the same sizes as the 5-colour option (i.e. mini through queen size). There’s also a 5-colour table runner option 12"x36" and 16"x48". A 10-colour table runner option in both the 12"x36" and 16"x48" sizing. And there’s even a lumbar pillow! To make the pattern easy to follow, each project is separated into its own section so you can just focus on the project you want to make without having the other projects getting in the way. Plus, you can just print the section you need so you save on paper and ink too! Each project not only includes clear instructions, but also has step-by-step graphics so you can see what your piecing should look like. The pattern also includes a colouring page for each of the project options. There’s even a placeholder for your fabric colour swatches to make it easy for you to plan out your own design. The pattern includes pressing diagrams for each project and at each piecing step to make sure your seams nest for perfect points every time! 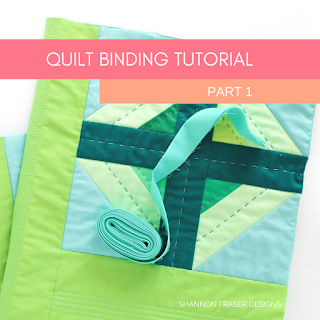 There are active hyperlinks throughout the pattern to take you to in-depth tutorials to help you if you need additional tips for your quilting success! Plus, there are some additional colourways to inspire you even more! Whew, that’s a lot of details and options! 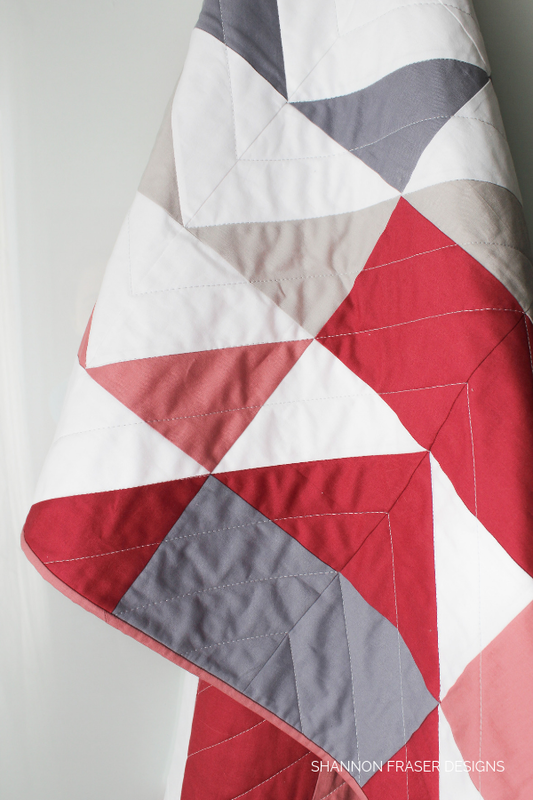 The mod-rose Modern Aztec quilt is the original version I designed. And yet it was the last one I made! The 5-colour option is perfect if you want to really focus on just a few of your favourite colour pairings. Here I went with a combination of greys and these dusty rose colours all balanced by the white background. If you have a tough time picking fabrics, this is a great place to start. And the colouring page can help you plan it out so you can see if you like the pairings before committing to buying the fabric. The design is quite bold and geometric, and you can play that up as much as you want through your fabric selection. The pattern comes together quite quickly too! 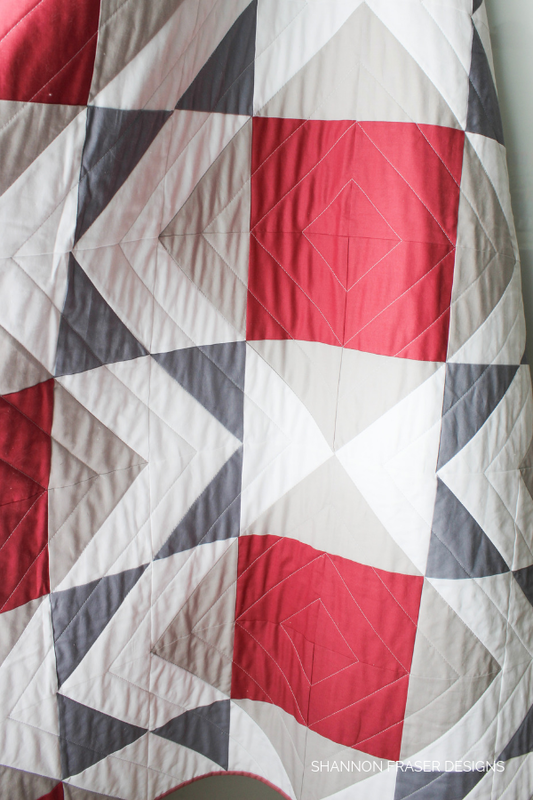 The backing on the mod-rose quilt was an unexpected piecing journey! I entirely planned on backing it with the solid rose; however, when I started unrolling my yardage, I noticed all these spots that looked very much like oil stains – eek! I haven’t a clue how those got there. My fabric cupboard is just that – fabric – so there is no chance of anything spilling or staining my fabric. I shared this with you on Instagram and turns out this is not a first. As I dug a little more, turns out this can happen at the manufacturing level when rolling the fabric onto the individual bolts. I’ve had dirt marks pop up in my yardage before, but usually on the edges. This was smack dab in the middle and they sporadically appeared throughout a 2-yard stretch. In the end though, I like how it turned out. I’m almost digging the back more than the front! 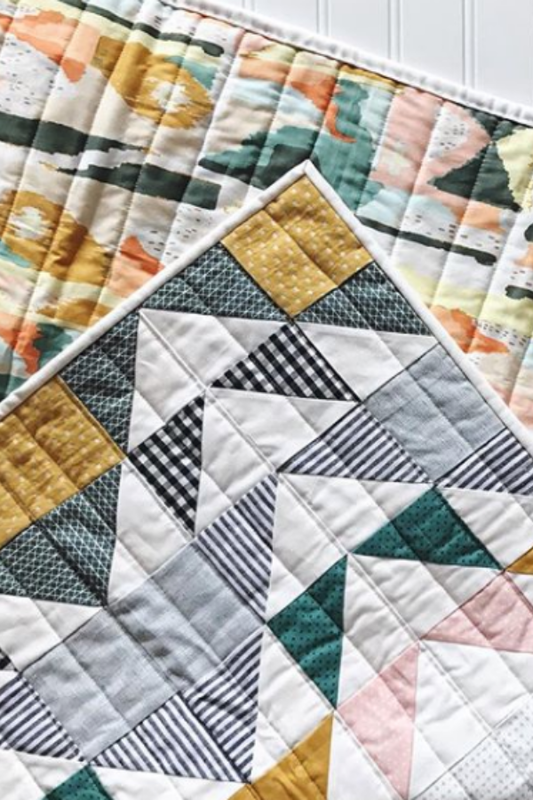 Especially since the quilting design really pops! 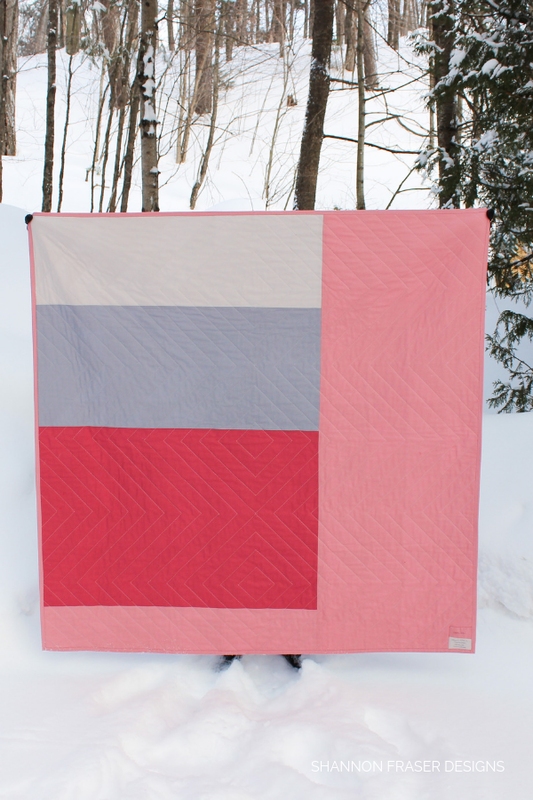 I’ve shared this gorgeous Bequest Modern Aztec quilt with you before, but I wanted to share her again so you have a visual comparison of the 5-colour vs. the 10-colour option. 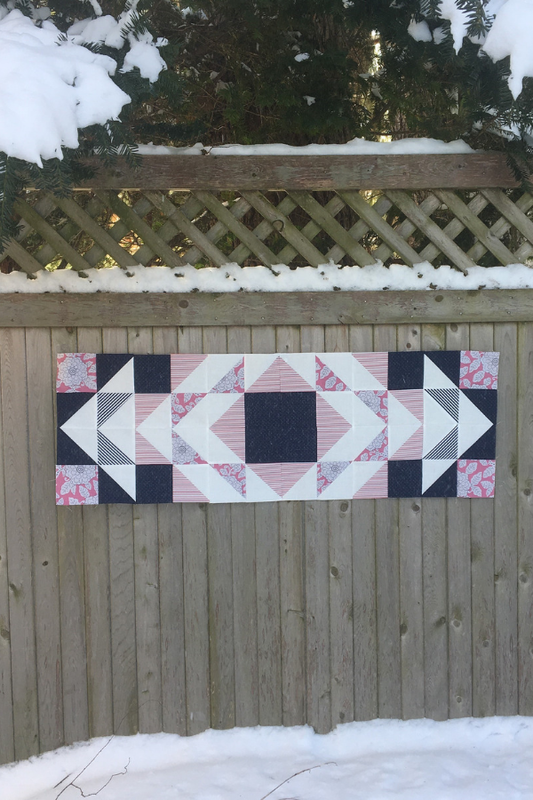 This was originally supposed to be a table runner, until the hubs saw the fabrics and was all “you have to go BIG”, which is how the 10-colour quilt was born! 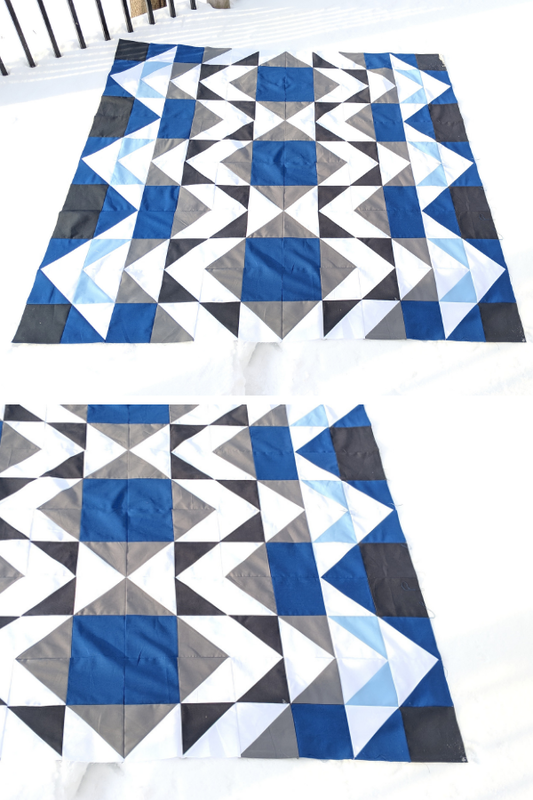 The pattern includes all the fabric requirements and cutting instructions for the 10-colour option in its own area within the pattern, so you won’t get confused by the 5-colour instructions, as the piecing, cutting and fabric requirements are all different. 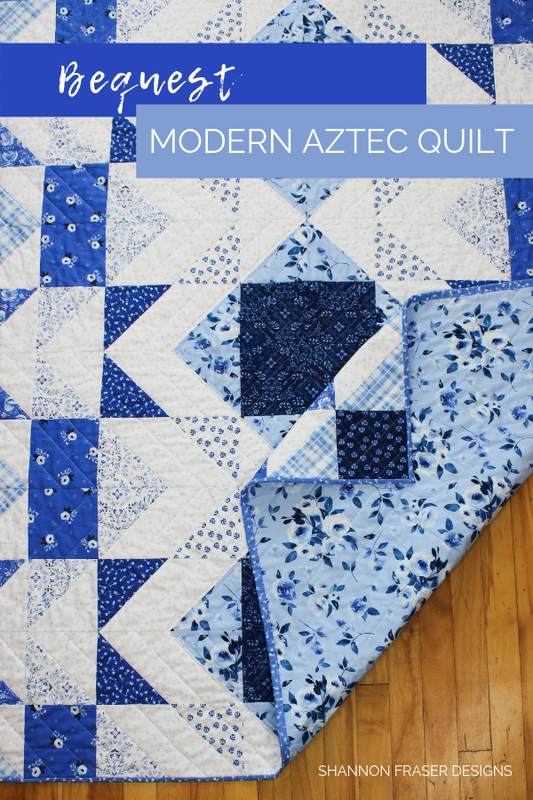 This is a great option if you would like to add more depth and interest to your final Modern Aztec quilt. 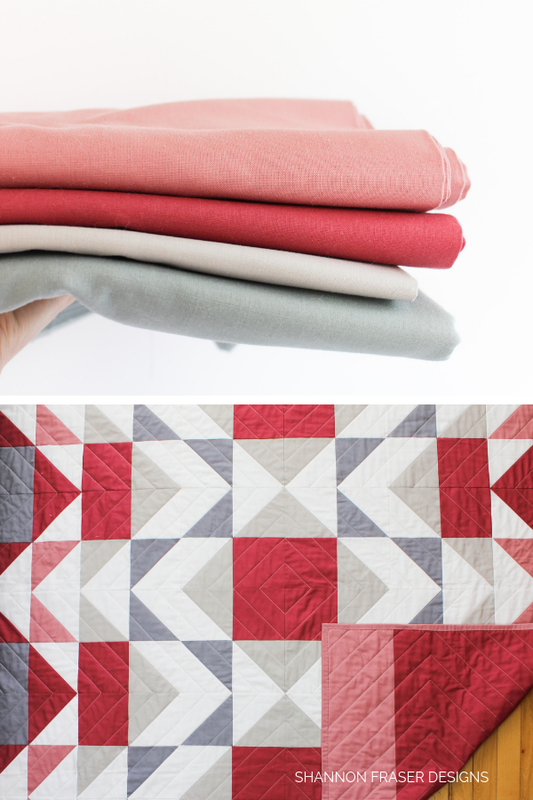 If picking 10 fabrics makes you a little nervous, the 5-colour option is a great place to start. Otherwise, use the colouring page to help plan out your idea and see if you like the look before committing. The design of the pattern is such that you really can’t go wrong, so dive in and have fun with it! 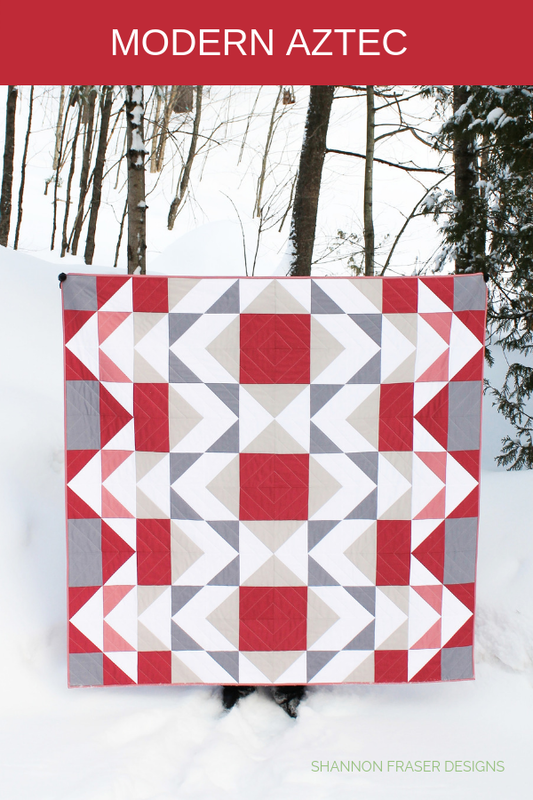 You can read more about the Bequest Modern Aztec quilt here. The Sonata table runner features the 10-colour option in the smaller 12"x36" size. It’s the perfect size to fit nicely in the center of a standard dining table, without taking away too much room from your place settings. This one comes together super quick and makes a great handmade housewarming gift too! The table runners are fat quarter friendly, so perfect for featuring some of your favourite bundles! 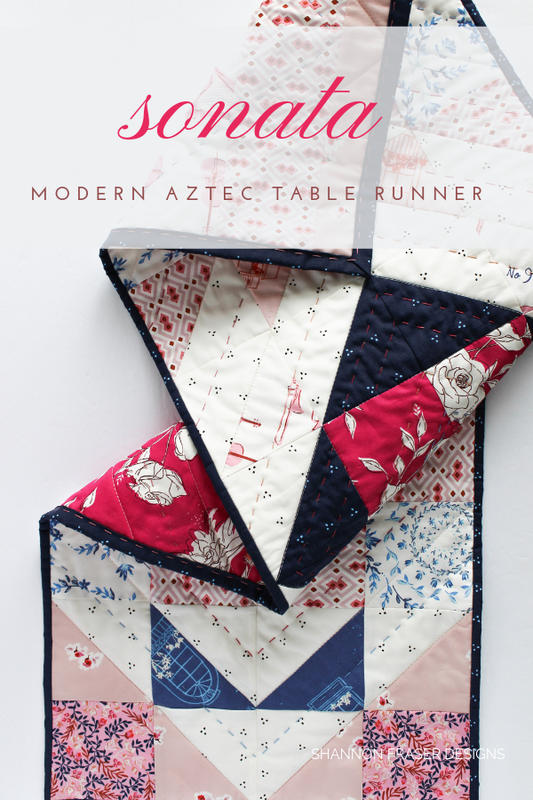 You can read more about the Sonata Modern Aztec Table Runner here. This Scandinavian inspired holiday Modern Aztec table runner is great example of using up your scrap fabrics. The Heather Rosas prints had been hanging out in my stash for years just waiting for the perfect project to use them in. The fact that they ended up being paired with these low volume prints from Art Gallery Fabrics just reminded me of how fun it can be to play! You never know what unexpected fabric combinations are waiting for you to discover in your fabric stash! You can read more about the Holiday Modern Aztec Table Runner here. The quilted lumbar pillow was totally unplanned! There are several leftover HSTs from the 10-colour quilt option that were hanging out on my sewing table and I just decided to play with them! 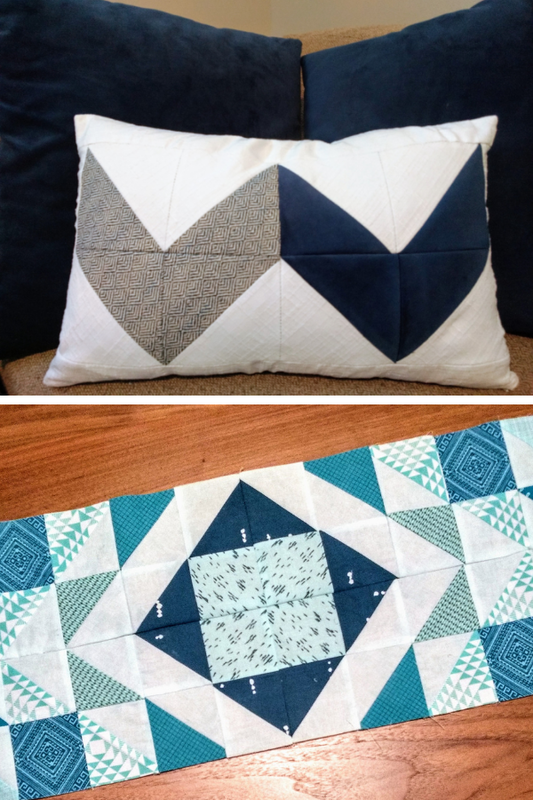 So, if you make the 10-colour Modern Aztec quilt then you’re already halfway on the road to finishing your Double Chevron pillow! Otherwise, the pattern includes the fabric requirements and cutting instructions to make the pattern from scratch. I love a zippered pillow cover, but I know zippers can be intimidating! To help you conquer this technique, the pattern includes lots of tips and graphics to walk you through the process. 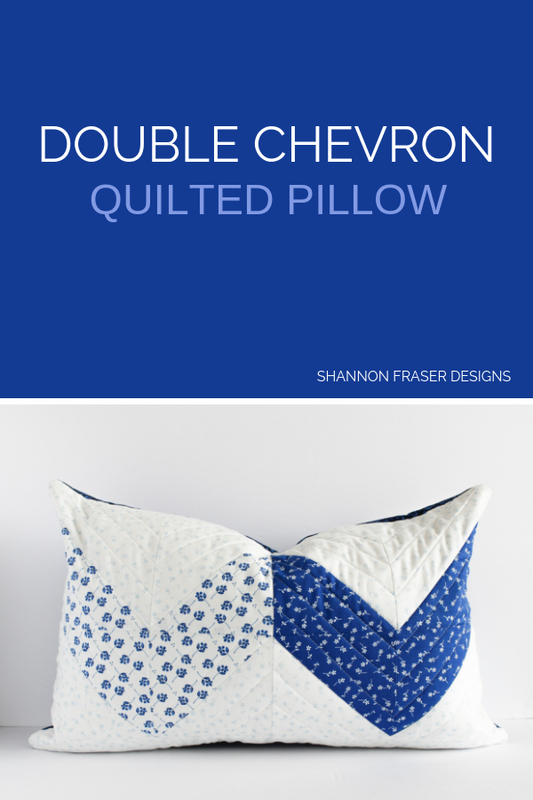 You can read more about the Double Chevron lumbar pillow here. Ange from A Little Patchwork made this fun mini 5-colour version and I just love her gender neutral fabric pull with a pop of yellow – it’s giving me all the summer vibes during this cold snap we’re experiencing in Montreal! 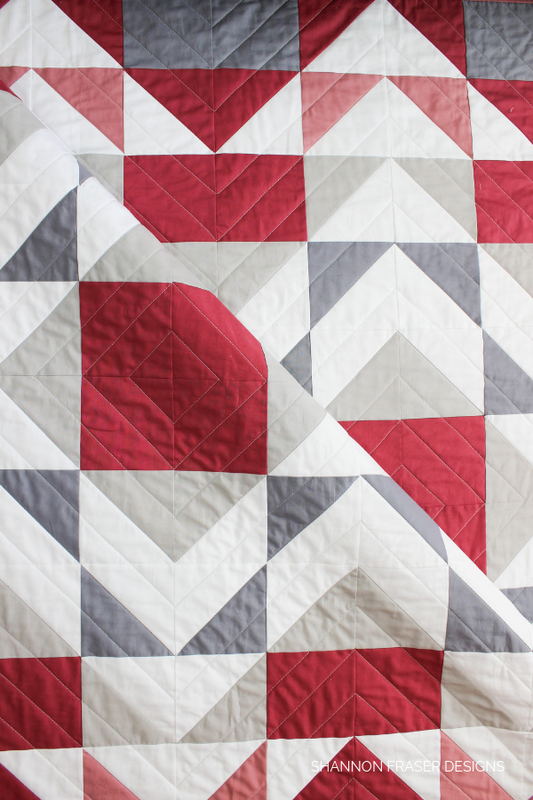 Jennifer’s fabric pull for her crib Modern Aztec quilt is just so spot on and totally fits the Aztec theme! I love a good mix of prints, and she’s outdone herself with this combo. And did you notice that perfectly coordinated backing! See more of her fun makes over at Penelope Handmade. L.T. made this stunning 5-colour throw version and her colours stopped me in my tracks! Seriously makes me want to bust out my florals and get stitching! 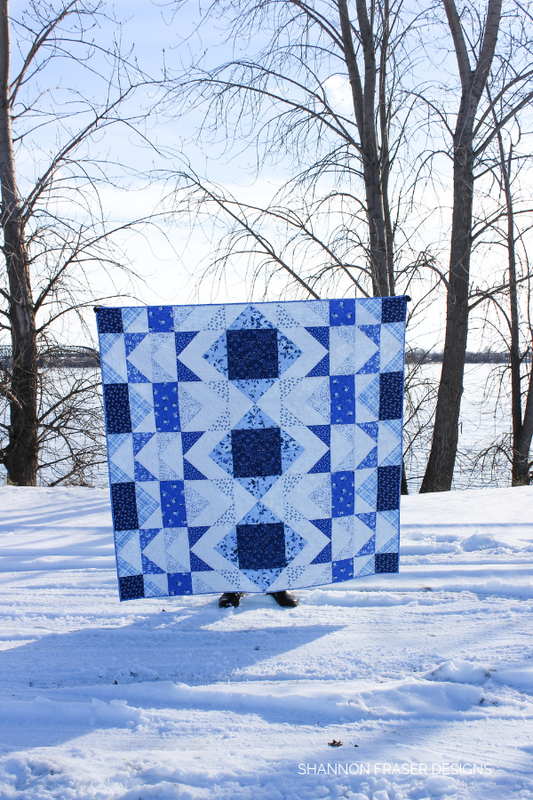 and this blue and white 5-colour Modern Aztec quilt is no exception. Kelly’s a Rockstar and made a 5-colour crib quilt, a 10-colour table runner and the Double Chevon pillow featuring upholstery fabrics. Did you see that gorgeous navy-blue velvet – swoon! Kate, from Kates Makes and Creates, stitched up this eye catching 5-colour table runner. Did you catch that stripe she included? Perfect detail to compliment the deep navy and floral prints. 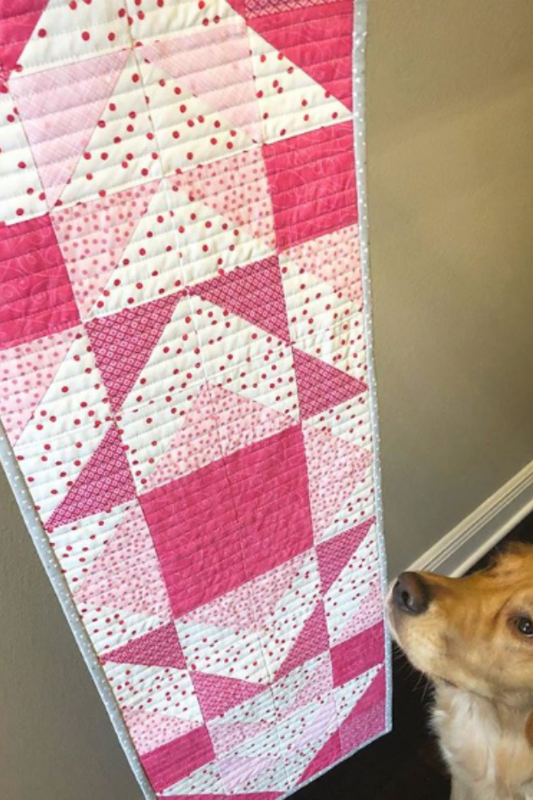 Emily’s table runner is giving me all the Valentine’s Day vibes – perfect handmade touch for celebrating at home with your loved ones 😊 Plus, who can resist Beau’s cute face! See more of Emily’s gorgeous work at Homemade Emily Jane. 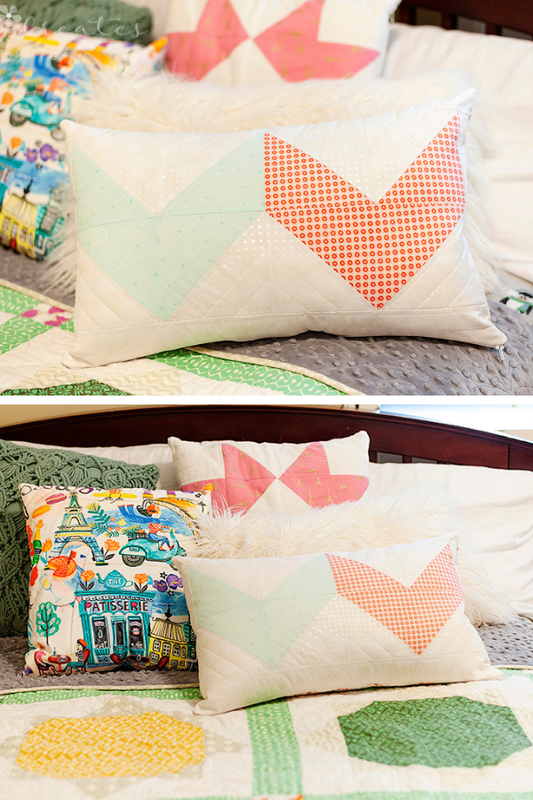 And rounding out all these gorgeous makes is Angela’s spring inspired pillow. I love that light aqua paired with the orange – such a stunning combo. You can see more of Angela’s work over on her website ALC Creates. Be sure to check out the #modernaztecquilt, #modernaztectablerunner and #doublechevronpillow hashtags on Instagram for more inspiration. 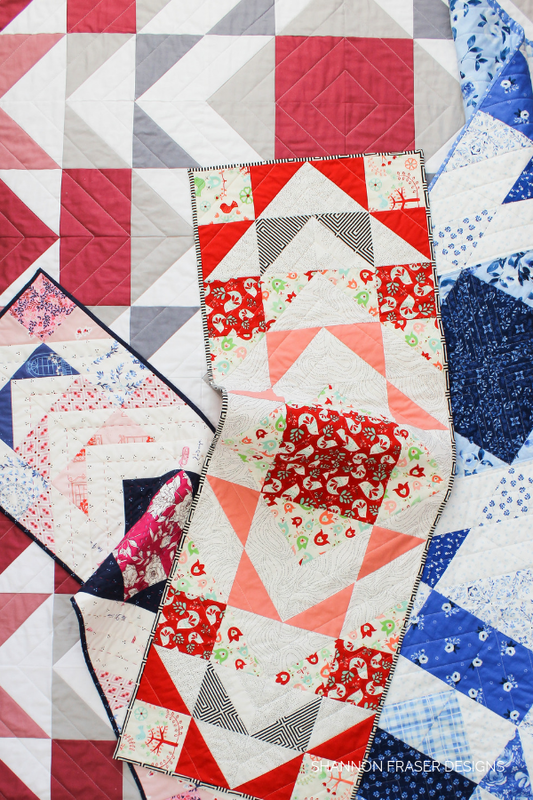 If piecing isn’t your jam and you prefer focusing on the quilting, then you’re in luck! 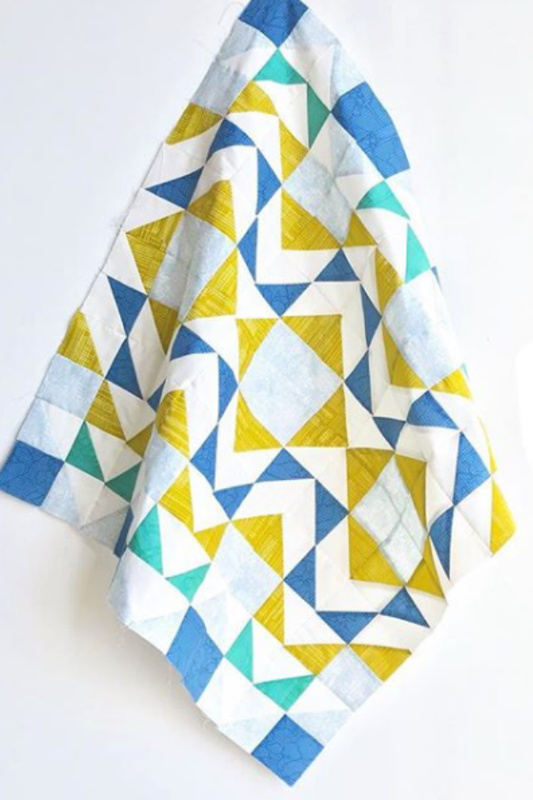 I’ve shared several colourways over on Honest Fabric where you can print a whole cloth design and jump straight to quilting! PS I’m thrilled to be knocking the Mod-Rose Modern Aztec quilt off my Q1 FAL 2019 list! Thank you so much, Yvonne! Definitely lots of sizes to choose from, but options are always fun, right?! Congrats on a new pattern Shannon! It's a stunner! 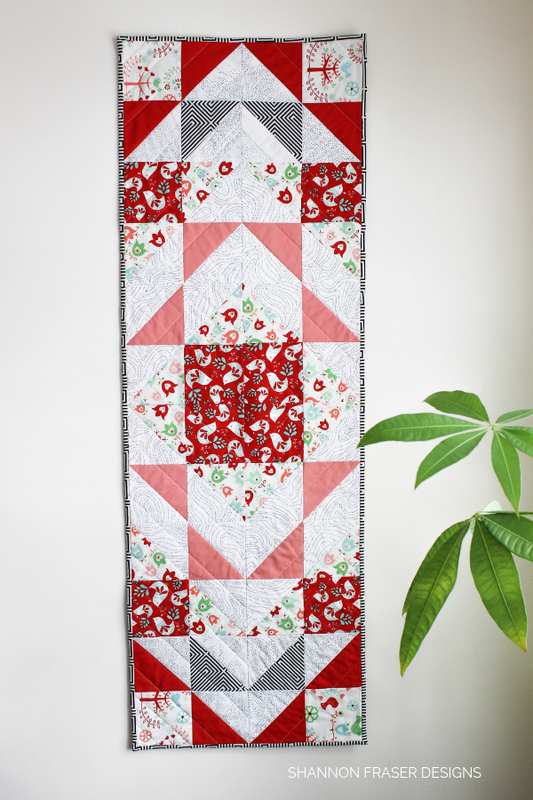 I love the table runner but it's not something I would use so it's a quilt for me. 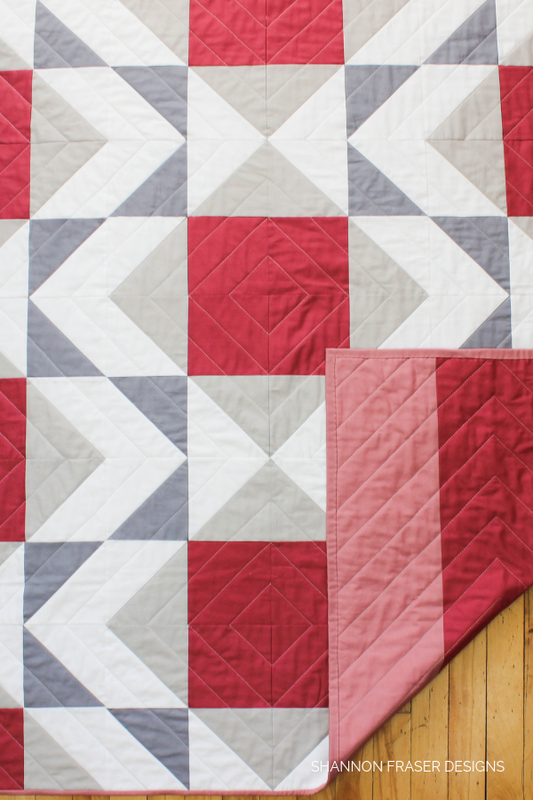 It looks fast and simple so great for a birthday quilt on a deadline! Thanks for the congratulations, Sue! She is a quick make with lots of opportunity to chain piece – love those 😉 Lucky birthday recipient!! 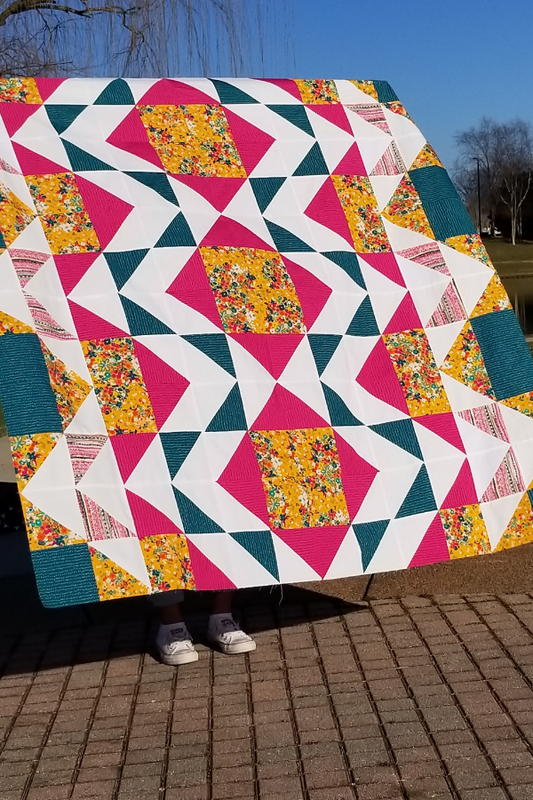 Congrats Shannon on another stunning pattern! Always so well written and clear with lots of diagrams. Thanks for the shout out! I would pattern test for you any day! Fabulous pattern Shannon. I truly appreciate you showing us so many sizes and color combos. I'm thinking about doing a queen sized version and am wondering if the pattern stays the same, just bigger pieces or is the design different. Would you be willing to show a sketch or sample of the queen size if it is different? Thanks again for the extensive post of your beautiful design. Thank you so much, Maria! The pattern design stays the same irrespective of the size you choose. The only exception is the Crib size which is a little longer than the others. Let me know if that helps! 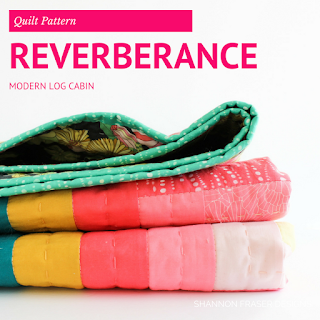 I love seeing the versatility of the pattern with all the different color/fabric choices! Thank you for participating in the FAL, on behalf of the 2019 global FAL hosts. Thank you so much, Sarah! I love a pattern that offers lots of choices too 😉 Look forward to seeing everyone’s projects that get completed this quarter! !